If you book 2 or more places on any training course you will receive a 10% discount on each place, for our flagship NLP Practitioner training that is £149.90 for the additional place. To take advantage of this offer, please contact me for details. If you book on multiple courses at the same time, you can make considerable savings compare to booking on the individual courses. Below are my current offers. This is exceptional value and is my most popular offer, with over 75% of people who book with me choosing this option. For more details and to book, click here. If you want to utilise coaching, either in your existing role or by retraining as a private coach, this is the perfect course for you. It combines the skills and strategies of coaching and NLP and gives you everything you need to become an effective coach. Withver 150 hours of classroom learning this conforms to the most rigorous international standards. 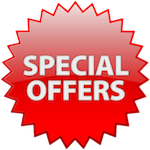 All these special offers are available at the time of booking only. You only need to pay a small deposit at the time of booking to confirm your place. If you have any questions or would like to discuss these offers in more detail please call me on 08453 626277 or click here to contact me. Please bear with me whilst the changes are being made. Due to family commitments I only see clients on Tuesdays at the moment.